In the last nine months four people have been criminalised for protesting against ANJ’s oil palm plantations. « South Sorong: Oil palm industry continues its rapid expansion. Within the last nine months, state forces have laid criminal charges against four of the local indigenous landowners whose land has been grabbed by oil palm plantations PT Permata Putera Mandiri and PT Putera Manunggal Perkasa, both subsidiaries of Austindo Nusantara Jaya Agri, owned by tycoon George Tahija. The four include Obet Korie (52 years old) and Odi Aitago (26 years old) who are both from the Iwaro ethnic group in Puragi village, Metamani subdistrict, South Sorong Regency. Obet was sentenced to seven months in prison and Odi five for criminal damage to PT PPM’s property when they were demonstrating outside company offices in Sorong on 16th May 2015. The other two men are Ayub Aume (47 years old) from Benawa village and Daud Duge (48 years old) from Anuni village, in Kokoda District. 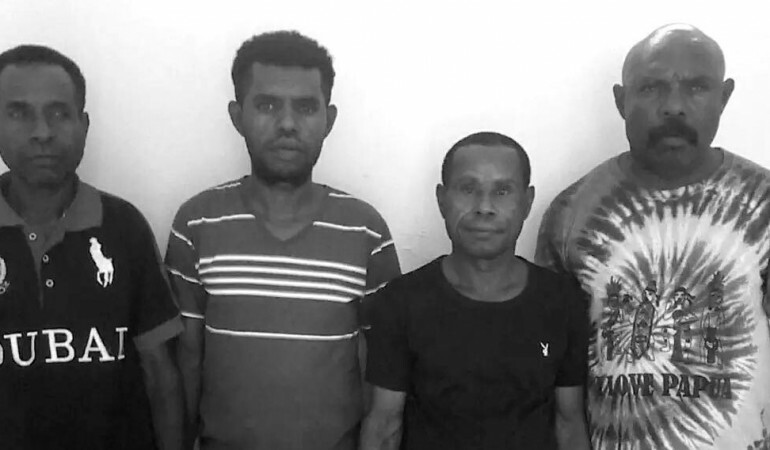 Ayub and Daud have been held at the South Sorong police station since December 2014. Both are also threatened with criminal charges under article 170, clause one and two, of the Indonesian criminal code, for allegedly acted together in public to commit violence towards persons or property. As their lawyer Loury da Costa explained, “Ayub and Daud are village officials (meeting hall manager and village head), who are suspected of, with others, being involved in a protest action to demand the payment of compensation from oil palm company PT PMP which they are entitled to but have not yet received”. On 16th September 2015, Ayub and Daud were transferred to Sorong jail. They are still awaiting the start of their trial process in Sorong District Court. As people say, the law is strict for people at the bottom but softer for those at the top, and so people demanding their rights and asking for justice must then face the legal establishment and are criminalised. Meanwhile the powerful individuals who take their land without giving the local landowners the chance to all sit down together and make a consensus agreement are free to do as they please. In April this year, when Luhut Binsar Pandjaitan was still working as the Presidential Chief Of Staff, he said in his address to the inauguration of the new board of the Indonesian Palm Oil Producers Association (GAPKI) “the government must protect the oil palm industry, if any ministry stands in the way of the development of the national oil palm industry, we’ll just bulldoze through them”. He is now in a new position, the coordinating minister for Politics, Law and Security. It seems as if Luhut’s message was not only intended for the ministries but also directed towards the people who stand up for their land and rights and who are being evicted and imprisoned by the powers that be. Justice for the people remains very far away. In Puragi Village, the Gue clan is suing PT PPM in the Sorong District Court with the help of layers, on the basis that the company has cleared land for a plantation and access road without the agreement and consent of the Gue clan. The material losses are estimated at 6.6 trillion Rupiah, which includes the loss of the forest, environmental damage to riparian zones, water sources that have dried up, historic and sacred places which have been destroyed and damage to sago groves and hunting grounds which the people depend on for their livelihood. The Gue clan is demanding this be paid in full and that the company leaves the disputed land and returns it to them. This entry was posted in Around West Papua and tagged ANJ Agri, Anuni, Benawa, PT Permata Putera Mandiri, PT Putera Manunggal Perkasa, Puragi. Bookmark the permalink. Comments are closed, but you can leave a trackback: Trackback URL.